I've fallen a bit in love with Brixton Village, the indoor market that is home to some of London's most exciting foodie spots, all under one roof. I've been to four different restaurants within the walls and I've been impressed with each and every one, but it's a humble little pizza place that really stands out. 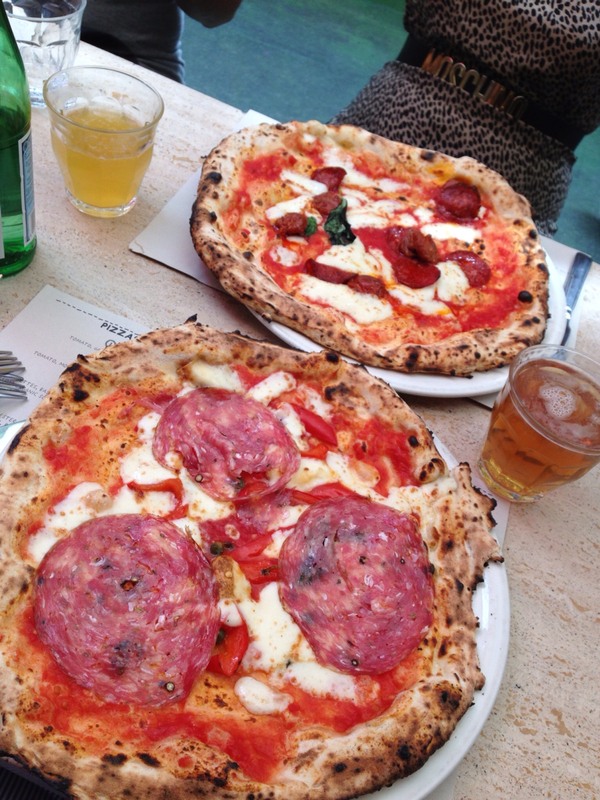 Franco Manca. Frequently cited as the best pizza in London it was somewhere I've been meaning to give a go ever since moving 'darn sarf'. Well, quite simply, it was the best pizza I have ever eaten. A slowly risen sourdough base, blackened and charred round the crisp yet chewy crust, topped with really high quality ingredients that were fresh and vibrant tasting thanks in no small part to the extremely short and sharp cooking time (an insane 40 seconds at 500*C to be exact). I went for the daily special which was topped with a beautifully flavoursome finocchio (fennel seed) salami, sweet peppers and a moist, gently smoked mozzarella. The star of the show for me though was Colette's pizza, which was strewn with soft spicy chorizo as well as a second, firmer variety which turned nicely crisp, giving a fantastically well balanced flavour and texture to the pizza. Both pizzas were sparingly smothered in a rich, fresh tomato sauce and not overloaded with cheese - the down fall of so many pizza restaurants. On the beer front you've got the choice of two British microbrews. I went for the Green Devil pale ale, which was more like a hoppy lager really, but nice all the same, and a good, unobtrusive match for the pizzas. Prices are also absurdly good, starting from £5.90 for a fresh basil margarita, to £6.85 for the chorizo and £7.50 for the salami pizzas we had. P.s. as with (I think) all the restaurants in the Brixton Village market, Franco Manca don't take reservations so expect to queue at peak times (but at least you're queuing indoors). Once seated service is snappy though. Is cider the next 'big thing' in beer?